There is the popular but mistaken belief among Sri Lankans and elsewhere that “Mahavamsa”, a chronicle composed and written by Mahanama Thera in the sixth century is a record of the history of Ceylon. Anyone who reads Mahavamsa will find, besides various historical data, stories of miracles and supernatural happenings on various auspicious occasions, like instant earthquakes, floods, storms etc. However, discarding these fables, one will notice the author devoting nine chapters, (out of thirty three chapters) on Dutugamini, the Naga Buddhist king who defeated the Tamil king Elara in Anuradhapura in BC 101. While concentrating on Buddha’s visits to Sri Lanka, it has to be pointed out that Mahavamsa’s author Mahanama Thera concluded each chapter by stating, “ that this chapter is compiled for the serene joy and emotion of the pious”. This statement expresses his motive and purpose, which was that Mahavamsa was meant and intended for pious and religious Buddhist devotees and their pleasure, and not meant to record the history of Sri Lanka. However, Mahavamsa without doubt records the historical data regarding the kings who ruled Ceylon starting from Devanampiya Tissa’s rule in BC 247, who introduced Buddhism in Ceylon, until the rule of Dhatusema in 351 AD. Prof. G.C. Mendis, a well-known history scholar’s statement is relevant here, (Early History of Ceylon in 1948. ); “Mahavamsa records is mainly traditional history, and its statements have to be carefully examined before they are accepted as historical evidence.” Consequently various examinations supported by archaeological investigations and undertaken by local Sinhalese and foreign researchers have revealed and dissected the truths and myths recorded in Mahavamsa. One of the unauthenticated stories is the much-believed Vijaya and his 700 friends landing in Sri Lanka by boats from North India in BC 483. Mahavamsa records this event as happening on the day of lord Buddha’s attainment of Nirvana in North India. Undoubtedly this statement was recorded to glorify Vijaya. The story of Vijaya has long been doubted by various scholars including G.C. Mendis, S.P.E. 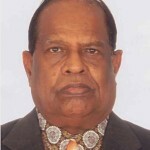 Senaratne, H.W. Codrington, Susantha Goonetilake in their historical publications. (The Vijaya legend, Pre-Historic Archaeology of Ceylon, A Short History of Ceylon, The Formation of Lankan Culture, Ancient Ceylon). It is mentioned that Vijaya’s grandparents were a wild lion and a Bengali queen who co-habited for sixteen years in a cave. This account is a piece of unconvincing imagination. There is also no account of Vijaya involving in Buddhist activities, and Vijaya even if this story is true was neither a Sinhalese nor a Buddhist, as Buddhism was introduced in Ceylon in BC 247 (not in BC 483), and Sinhalese language grew to its full form in the 6th-7thcenturies only. Thus the story of Vijaya as the first settlers in Sri Lanka is nothing but a figment of imagination by the author. The absence of historical literature, records or writings regarding the history of Sri Lanka’s Tamils from BC 500 provided ample opportunities to Mahanama Thera and the previous monks to engage in recording eventful imaginary and mythical accounts in Mahavamsa, the sources of which are Jataka tales, Hindu puranas and other epics like Ramayanam. It is to be noted that the history of Ceylon Tamils began to be researched and recorded only in the 1900’s. Until this period, Mahavamsa and Vijaya were believed as true, and as sources of historical information for all Sri Lankans. It is another piece of unauthenticated history which is woven around the lion grand-father, being the founder of the lion flag, and “Sihala” which got corrupted into “Sinhala” and then to “Sinhalese” as a race and language. Sinhalese race probably spoke Prakrit before the origin of Sinhalese language in 6th AD. So who were the original inhabitants of Ceylon? They were the ‘Nagas’ or ‘Yakkas’ without any doubt and Ceylon was earlier called as ‘Naga Land’ and ‘Naga Deep’. Lord Buddha according to Mahavamsa made his second visit to Sri Lanka in BC 528 to settle the dispute between two blood related Naga kings, Mahodaran and Chodotharan ruling different territories in the North. Nagas also lived in India as the names Nagpore, Naga land, and Nagapattinam in India vouchsafe this fact. Likewise, in Sri Lanka, one will find the Naga names for places, temples, and men and women especially among Tamils (Nagar kovil, Nagalingam etc). About the origin of Sri Lankan’s Tamils, history reveals that they lived in the north and northwestern parts of Ceylon more than 3000 years ago, as confirmed after the excavations of human remains, which were found in the buried urns in Anaicottai Manthai and Pomparippu. They were similar to the ones found in Tamil Nadu. The Nagas living in all parts of Sri Lanka also ruled Sri Lanka as many names of kings, confirm their names ending with ‘Naga’. With the introduction of Buddhism, which was widely practiced in Tamil Nadu from the 1st century to the 6thcentury, Buddhism came to be followed by the Tamils in the northern parts of Sri Lanka. Contribution to Buddhism by Tamil monks from Tamil Nadu is noteworthy. The most prominent Tamil monks who propagated Buddhism were Buddhamithira AD 5, Bodhidharma AD 6, who even went to China to propagate Buddhism like Vajirabodhi in AD 7. The Tamil epics of Kundalakesi and Manimekalai were purely Buddhism oriented. The Kandarodai excavations in Jaffna and the Buddhist remains confirm the practice of Buddhism by the Tamils in Jaffna. However, Buddhism lost its hold in Tamil Nadu, and among Tamils in the north due to the Saiva Bakthi campaign of Saiva saints particularly the four Nayanmars who spearheaded the emergence of Saivaism to control the influence of Buddhism and Jainism, which propagated down to earth radical policies and practices even denying the ‘existence of God’. Now, Mahavamsa’s account of Dutugemunu and how Dutugamini is now exploited by some politicians who conducted the wars against the LTTE deserves to be explained for the sake of truths. 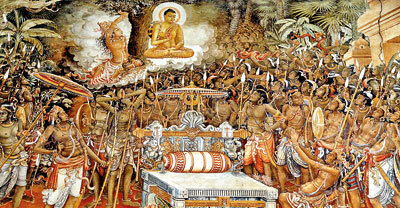 Dutugamini who defeated the Tamil king Elara in Anuradhapura in BC 101 is portrayed as a ‘Sinhalese hero’ who saved the Sinhala race and Sri Lanka from the Tamil invaders. This distorted version of racism has been inserted in the school textbooks, and no wonder the seeds of communalism and racial hatred have been allowed to pollute the minds of students, readers and public. The stark truth is Dutugamini was neither a Tamil nor a Sinhalese. He was a true Naga Buddhist whose parents were Hindus and even Dutugamini is said to have gone to worship the Hindu deity ‘Murugan’ at Kataragama, before proceeding to battle Elara. His army commander was Velu Sumana, a Tamil and Dutugamini never killed civilian Tamils during his entire period of life as a king or youngster. He honoured the fallen Tamil king and was mourning the deaths of soldiers from both sides for some days until consoled by the Buddhist monks. There is no record or evidence as to the famous statement purported to have been made by him to his mother about the reasons for his sleep with bended knees, which was due to threat from Tamils on one side and the sea on the other side. At the best, this was foisted or pasted to paint him as a Sinhalese hero and his battle as a communal one between the Tamil and Sinhalese Dutugamini. Like every king from the historical beginning he nursed the ambition of ruling the entirety of Sri Lanka under his one and only throne. This could not be faulted with as world’s history and even Sri Lanka’s history is replete with assassinations, coups, betrayals and killings aimed to capture power or remove political rivals. About the rulers of Sri Lanka from BC 247 up to Portuguese conquest in AD 1505, there were five Tamil rulers before Dutugamini’s rule and fourteen rulers including eight Naga rulers after Dutugamini from BC 50 to AD 295 in Anuradhapura from AD 1240 until AD 1618 eighteen Arya Chakravarthis ruled in Jaffna barring a period of seventeen years (AD 1450-67), when Senbagaperumal adopted son of Parakiramabahu the Sixth, who built the Nallur temple, ruled Jaffna. This Jaffna kingdom extended up to Puttalam, as the notes of Ibn Batuta an Arab trader who visited Puttalam in AD 1344 confirm. In the Eastern province, Batticaloa figured as the capital for many rulers exercising their powers. Records show about eighteen Tamil kings ruled from AD 20 to AD 1360, which included the Kalinga king Mahon also called as Kulakottan from AD 1215-55. It is to be noted that Mahavamsa mentions about the thirty-two Demela kings who were defeated by Dutugamini on his way to reach Anuradhapura. There is no denying of the fact that during Dutugamini’s reign Tamil kings were ruling all the regions in Sri Lanka, except the Ruhunu south ruled by Dutugamini. Undoubtedly, the Tamils have been living from BC 500 in Sri Lanka, later swelled by immigrations from Kerala and Tamil Nadu. “I suggest that the north of Ceylon was a flourishing settlement before Vijaya was born”. “ Long before the arrival of Vijaya, there were in Lanka five recognized Iswarams of Siva, which claimed and received adoration of all India. These were Tiru Keteeswaram Munneswaram, Tondeswaram, Thirukoneswaram and Naguleswaram”. Historical evidence proves the existence of Tamils in all directions of Ceylon who followed Saivaism before BC 500 and also the rules of Tamils all over Sri Lanka, except during Dutugamini’s rule, and until ended by Portuguese in AD 1620, who overpowered a valiant King Sangili. The present communal conflict centres around the policy of liquidation of the ancient Tamils as a race with their language and traditions. Tamils who are now living mainly in the north, and eastern parts of Sri Lanka are facing the lethal weapons of militarization, Sinhalisation and Buddhisisation, which were inaugurated by D.S. Senanayake in 1948. This has also resulted in the genocide of Tamils stretching from 1958 to 2009. The Sinhalese fears of preserving Sinhalese language and Buddhism from Tamils are illusory and unfounded as religion and language can be best preserved only by those who follow and practice them. Hinduism is the most tolerant religion in the world and when Periyar of Dravida Kalagam, an atheist started destroying statues of Vinayagar, he was not harmed and he lived up to 91 years, propagating anti-god policy. The Tamils are now demanding only to live as equal citizens, managing their own lives, language and affairs in areas where they have lived for more than 2500 years, even though they were rulers of entire Ceylon at various historical periods. The fact is all Sri Lankans are Indians by origin until Sri Lanka got separated 7000 years ago and later all becoming Tamils and Sinhalese speaking Tamil and Sinhalese, and following Hinduism and Buddhism. It is to be noted that the ancestors of two well-known families who changed the political history of Sri Lankans particularly the Tamils for the worse, S.W.R.D. Bandaranaike and JR Jayawardne migrated from Tamil Nadu in AD 15 and AD 17. Neela Perumal a Hindu priest appointed for Saman Temple in 1457 in Sri Lanka changed his name to Nayaka Pandaran and then to Bandaranaike. JR Jayewardene’s family belonged to the Chettiar sect in Tamil Nadu, and their descendants later adopted the Sinhalese name Jayewardene. 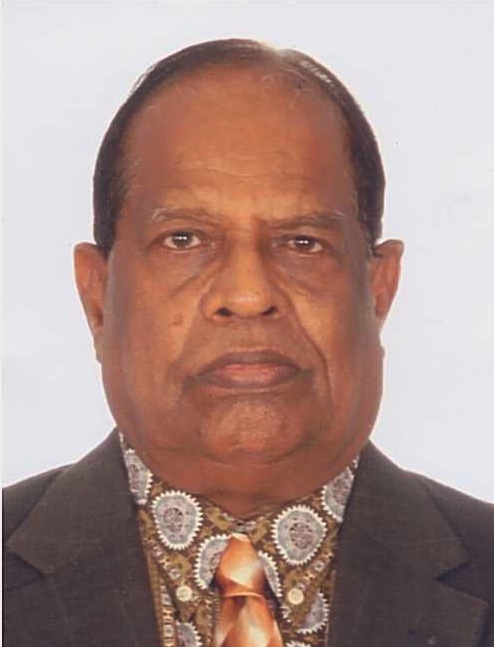 JR is the direct descendant of Don Adrian Wijesinghe Jayewardene, earlier called as Thambi Mudaliar who died in 1830. The above Hindus later became Christians during colonial rule and became Buddhists to grab the political power in Sri Lanka. “These traditions have been handed down orally for nearly a millennium before they were recorded in chronicles’. “Many Dravidians who settled in Ceylon learnt Sinhalese language and became Sinhalese”.